Flux Cored Arc Welding (FCAW) has been a viable welding process for structural steel erection, heavy equipment repair, bridge construction and other similar applications for many years. They offer high deposition rates, excellent chemical and mechanical properties, and the weldability needed for these jobs. 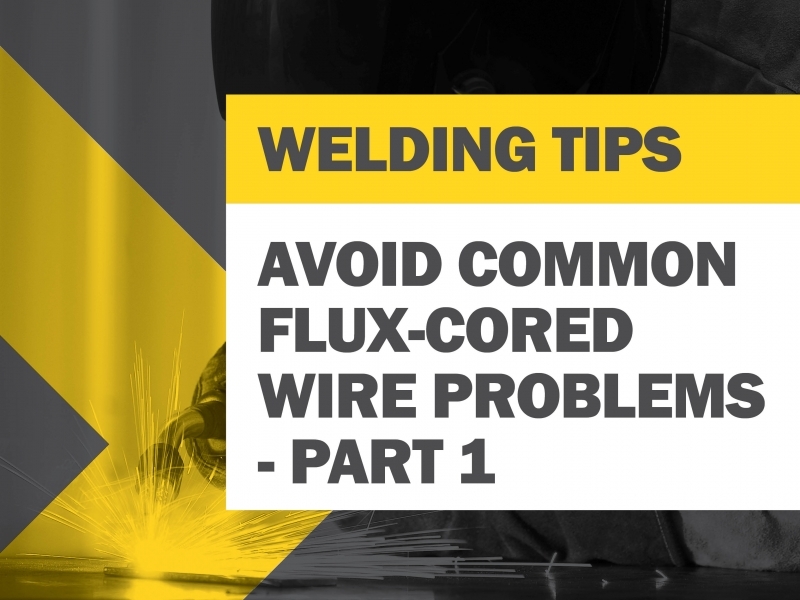 Like other welding process, flux cored welding comes with some challenges, but with some know-how and a bit of practice you can prevent common problems and gain the weld quality you need. To help we’ve put together some tips associated with common wire feeding, porosity and worm tracking problems. The wire melts into a ball at the end of the contact tip which is most often the result of too slow of a wire feed speed and/or holding the welding gun too close to the workpiece. A tangle of wire that halts the wire from being fed. Use knurled V or U groove drive rolls in your wire feeder. FCAW wire is much softer, if you use the incorrect drive roll, it can easily compress the wire. Set the drive roll tension correctly - release the tension on the drive rolls then increase the tension while feeding the wire into the palm of your welding glove, then continue to increase the tension one half turn past wire slippage. Check for liner blockages. If there is a blockage replace the liner. Always trim the liner (using the correct tools). Check that the liner does not have any burrs or sharp edges and always use the correct size liner for your diameter of welding wire. Porosity happens when gas becomes trapped in the weld metal and can appear at any specific point on the weld or along its full length. Remove any rust, grease, paint, coatings, oil, moisture and dirt from the base metal prior to welding. Use a filler metal with added deoxidizers, it helps weld through such contaminants, but pre-cleaning is still required. Always maintain an appropriate electrode extension or stick-out. As a rule, the wire should extend no more than 32mm beyond the contact tip. Worm tracking leaves marks on the surface of the weld bead which is caused by gas the flux in the core of the wire creates. Follow the voltage parameters recommended by the filler metal manufacturer for the specific diameter of welding wire. If worm tracking does occur, reduce your voltage by increments of one half volt until you eliminate the problem. Using these valuable tips should result in good welding technique, and your ability to prevent these problems—or identify and rectify them quickly without sacrificing time or quality.